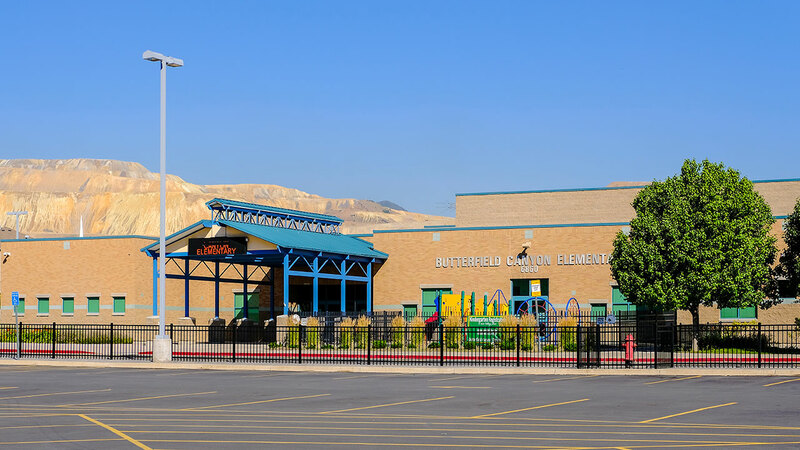 Butterfield Canyon has approximately 900 students enrolled in Kindergarten through 6th grade. The school has a clean-line design featuring flexible space classrooms, a centrally located media center, a spacious gym with a stage area, and up-to-date computer labs. Each classroom is equipped with audio enhancement, a document camera, Apple TV, and a digital projector system. Butterfield Canyon is on a traditional school calendar. School begins at 9:00 a.m. and ends at 3:35 p.m. Monday through Thursday and begins at 9:00 a.m. and ends at 1:55 p.m. on Fridays. The teacher/pupil ratio is on average 1:22 in Kindergarten-3rd grades and 1:26 in 4th-6th grades. Actual class sizes may vary year to year. Bus service is provided for students who live 1.5 miles or more from the school. A nutritious hot lunch is prepared and served daily. Butterfield Canyon Elementary staff includes over 30 certified teachers. This number includes specialists in Speech/Language, Psychology, Intervention, and Special Education. In addition, over 30 classified employees serve in various other positions in the school that provide students with the support services that promote learning and maximize student success. All certified staff hold current teaching certificates with several teachers having earned advanced degrees and educational endorsements beyond the regular teaching certificate. All staff members are formally evaluated on a regular basis for the purpose of improving performance. Teachers continually participate in professional development courses to improve instructional skills. Butterfield Canyon is a Professional Learning Community where teachers work collaboratively in teams to meet individual student learning needs by providing additional support, intervention, and enrichment. Instruction in each grade follows the Utah State Core Standards. Butterfield Canyon is a “Leader in Me” school that teaches leadership principles to students. The 7 Habits of Highly Effective People are embedded in classroom instruction. Technology training is an important aspect of the school curriculum. Our computer labs enable all students (K-6) to learn and practice keyboarding skills, word processing programs, and work with software in core content areas. Teachers provide direct literacy instruction in both whole group and skill-based group settings. Math is taught using a variety of methods while utilizing the Math Expressions textbook as a resource. Butterfield Canyon has a before-school choir program that allows students in grades 4-6 to experience the joy of vocal music and performing as a group. We provide a literacy enrichment program called The School of Rock to challenge our accelerated readers. Butterfield Canyon Elementary follows the Jordan District Dress Code that requires clean, neat, modest clothing. Students are expected to learn self-discipline and behave appropriately. If serious problems arise at school – the student, teacher, parents, school counselor, and administration work as a team to find the best solution for the student. An active PTA and School Community Council assist with school activities and regularly give input on important school issues. Students at Butterfield Canyon are taught responsible citizenship as teachers set reasonable limits, reinforce positive behavior, and employ programs to build student self-esteem. Butterfield Canyon students participate in a fitness testing program in 4th-6th grades where students can earn the Buff and Fit Bobcat Awards. Students are given opportunities to develop leadership skills in their classrooms and in school-wide leadership roles. School visitors and volunteers are welcome at Butterfield Canyon. Through the Learning Links program, volunteers engage in supporting the educational process through their work within the classroom and support at home. It is our hope to have every family, whose students attend Butterfield Canyon, give of their time and service in the quest to educate the youth of today and the leaders of tomorrow.